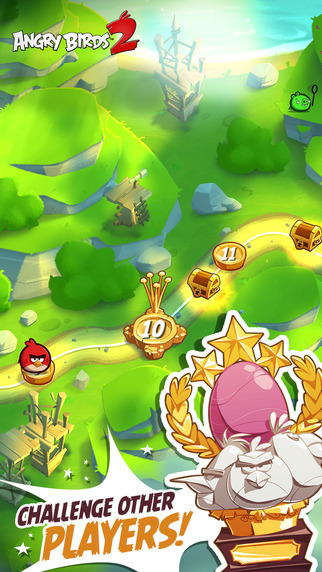 Finally, the app Angry Birds 2 for Android, iPhone and iPad has been released. After the franchise had moved lately in different directions and in between has been combined with Angry Birds Star Wars with other well-known brands, it now goes back to the roots. In December 2009, almost 6 years ago, the game Angry Birds, came in the App Store and has been a worldwide hit. But for some time, it no longer runs so well for the developer and publisher Rovio. Of course, the question arises whether Angry Birds 2 can build on the successes. We dare even to doubt this. The gameplay of Angry Birds really everyone should know: From a sling different birds are fired. The goal is to destroy all the pigs who are hiding in various constructions. Reason: The pigs have simply stolen the eggs of the birds. This is how Angry Birds works too. Also many well-known game characters are back again, whereby Red (the red bird) now unlike Angry Birds has a special skill. However, there are some new ideas and innovations in the game Angry Birds 2. From now on you the birds are available as cards. Accordingly you can exchange these cards and so decide for yourself when to use each bird, with his special skills . If a certain number of points achieved, one more card is added. Furthermore, a level in Angry Birds 2 now consists of various constructions which only need to be done sequentially. However, this is due to the fact, that there are now lifes available in the game (see the next chapter). In general, in Angry Birds 2 much more emphasis has been placed on animation and the graphic realization. So now a lot more action and movement is in the game. The more points you win in a level at Angry Birds 2, the more stars there are, but that is again well-known. After some time it also comes to a boss fight in Angry Birds 2, where this one needs to take multiple damage in contrast to the normal pigs. However, there is also a strong points of criticism in Angry Birds 2, which is so similar in many other games and is already well-known. So in the new Angry Birds 2 there is also a limited number of lives. If a level with the given cards is failed, you lose a life. These cards recharge after some time again, however, if you does not have the time, you have to wait or use the premium currency gems. Who don’t wants to lose a life, can use these gems even to get three more cards. Also new is the arena in Angry Birds is 2. Here you compete against other players. It will be unlocked at level 25, more about this will be available soon! Compared to the original title Angry Birds 2 is much more detailed, offers more entertainment and action. The background sound suits to the game. Numerous new ideas such as the use of cards that can be changed continuously, new special abilities and new level ideas, should appeal to all fans of the game series. Slightly negative is the use of life’s. While this is not really a problem at the beginning, it is later ( at the more difficult levels) a real irritating factor. 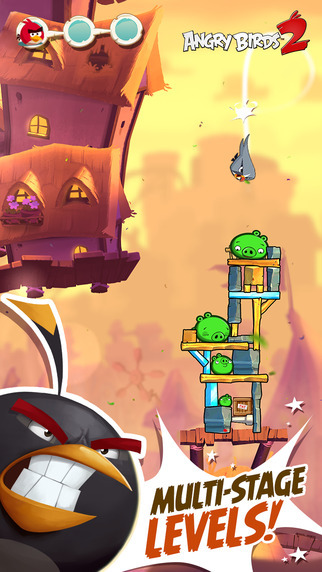 Angry Birds 2 is available for free for Android, iPhone and iPad. The game is financed via in-app purchases. Those who have already played the other parts such as Angry Birds Star Wars and Co, will may only like the new levels. Much changed except the things described above has in fact not. To download Angry Birds 2 for iPhone, iPad and iPod Touch just follow the link below and you will find it on the iTunes App Store.